Monday, October 5 | 7:30 p.m.
As the head of the United States Department of Agriculture, Secretary Vilsack oversees a $134 billion portfolio that includes leadership on food, agriculture, natural resources, and rural development. Join us for a wide-ranging conversation about food aid and international development, obesity and nutrition, food security, farm and foreign trade policy, and a host of other topics related to the USDA’s mission. Please bring a non-perishable food item to help those in need. This event is part of The Ultimate Homecoming. As a follow up to the event we wanted to share with you Deb Swackhamer’s summary along with a link to an audio of the Freeman Forum lectures from April 8th, 2008. Deb Swackhamer’s summary paper (swackhamer08) of the Water lecture program is a spectacular piece of work that underscores the stature of the lecture program series in a way that we’ve never been able to do before. It also illustrates the value of the work that all of us involved in putting together these programs can see in a tangible form. Thanks for your attendance. We look forward to seeing you next year! Minneapolis, Minn. (03/25/08)—Water quality impacts everything—from our food and our health to the environment and the economy. The 2008 Freeman Lecture will focus on the implications and complexities of policy decisions we make about water resources from 9 a.m. to 4 p.m. on Tuesday, April 8, at the Humphrey Institute of Public Affairs, 301 19th Ave. S., Minneapolis. Rep. James Oberstar, chairman of the House Committee on Transportation and Infrastructure, will deliver the morning keynote address from 9 to 11 a.m. Oberstar’s committee has jurisdiction over America’s inland waterway system, international maritime commerce, U.S. Corps of Engineers’ support of the nation’s water resources, and the federal clean water program. Prior to his election to the 8th district, Oberstar staffed the Congressional committee that drafted the original federal Clean Water Act in 1972. Steve Morse, executive director of the Minnesota Environmental Partnership, will follow Oberstar’s remarks with a luncheon address. The program will conclude with afternoon panel discussions about water policy issues in Minnesota, such as the Great Lakes Compact, regional water access, and the quality of water resources throughout the state. The Freeman Lecture is free and open to the public, with a nominal charge for lunch ($20 for the general public; no charge for high school and college students). Seating is limited, so pre-registration for the program and lunch is required. Movement toward an energy future less reliant on hydrocarbons has revealed a new range of national policy and political issues, none more critical than the question of food versus fuel. By one estimate, one-fourth of the U.S. corn crop in 2008 could be consumed in ethanol production, causing increased prices for corn, with a carryover effect on other crops. Local corn growers welcome the promise of higher incomes, but other producers worry that higher feed costs may cut their profits. The social consequences of higher commodity prices also have global implications, such as the higher cost of tortillas—a dietary mainstay for the poor—in Mexico and other places. argued that diversion of corn from food to fuel could pit the world’s 800 million motorists against its 2 billion poorest people who are simply trying to survive. Also included in the day’s events will be an update on biofuels research at the University of Minnesota and panel discussions with local legislators and representatives of the farming and agribusiness communities. Lester R. Brown, founder and president of Earth Policy Institute, has been described by the Washington Post as “one of the world’s most influential thinkers” and as “the guru of the global environmental movement” by The Telegraph of Calcutta. The author of numerous books, including Plan B 2.0: Rescuing a Planet Under Stress and a Civilization in Trouble, Brown helped pioneer the concept of environmentally sustainable development. His principal research areas include food, population, water, climate change, and renewable energy. Prior to founding the Earth Policy Institute, Brown was president of Worldwatch Institute, which he founded in 1974. Brown earned master’s degrees in agricultural economics from the University of Maryland and in public administration from Harvard University. In 1964, he became an adviser to Secretary of Agriculture Orville Freeman on foreign agricultural policy. In 1966, the Secretary appointed him administrator of the department’s International Agricultural Development Service. In early 1969, he left government to help establish the Overseas Development Council. Robert Elde was named dean of the University of Minnesota’s College of Biological Sciences (CBS) in October 1995. A 1969 honors graduate of North Park College in Chicago, Elde received a Ph.D. from the University of Minnesota in 1974. 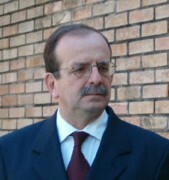 He joined the University faculty in 1977 and is the J. B. Johnston Land Grant Professor of Neuroscience in the Department of Neuroscience. Elde received an honorary Doctor of Medicine degree from the Karolinska Institute in Stockholm, Sweden, in 1996. As dean of CBS, Elde has led efforts to create the University’s Initiative for Renewable Energy and the Environment; create University Enterprise Laboratories, a privately funded incubator for start-up biotech companies; and launch Biodale, a “shopping mall” of advanced research services available to local companies as well as faculty members and students. It would be an honor for anyone to give the Freeman Lecture. It is a particular honor for me because I knew and worked with Orville Freeman for many years. I worked for him in the Department of Agriculture, closely, from 1965 until the beginning of 1969. We were reminiscing last night at dinner, Jane and I and some others. We remembered being in Afghanistan in 1966, I believe. We were there because the road from Kabul to Kandahar had just been completed and they needed a high-ranking American to cut the ribbon. Secretary Freeman was chosen particularly since the road had been built largely with Food for Peace and the workers had been paid with food under the US Public 480 program. It was a remarkable experience. There was this new highway, and the first to use it were camels! It was just out of synch with everything else. The pastoles, the migrants with their tents and their donkeys and sheep and goats, as Jane and I noted, seemed like they’d stepped out of the pages of the Old Testament. This was even more surreal because we were staying with the king in his palace. Later, when the monsoon failed in India, Secretary Freeman and I worked intensively to help restructure Indian agriculture, which set the stage for enormous, rapid growth and India’s achievement of self-sufficiency in a matter of years. Then in 1974, with a half-million dollar grant from the Rockefeller Brothers Fund to start the Worldwide Institute, I automatically thought of Orville Freeman to serve as chairman of the board. He served in that position from 1974 until his memory began to go—more than 20 years. So we had a long, very close and very satisfying working experience. There may be somewhere in the world where there is a CEO and board chairman who had a better working relationship than we did, but I would have difficulty imagining it. It was really exceptional. Today I’m going to be drawing some on Plan B 2.0, but will also draw on Plan B 3.0, which is scheduled for publication in January, assuming I don’t get into any bad traffic jams between now and then. Before talking about the food versus fuel issue, I would like to look at the big picture and put it in context. Ever since I can remember, we have been saying that the United States, with 5 percent of the world’s people, consumes a third or more of the earth’s resources. That was true. It is no longer true. China now consumes more of most basic resources than does the United States—grain, meat, oil, coal, steel. China consumes more of each of these than the Unites States, except for oil. We still have a wide margin in oil, though it is shrinking fast. China’s meat consumption is double that of the United States. It’s steel consumption is triple that of the United States. We are not even in the same league anymore. Now that China has overtaken us at the national level in the consumption of most basic resources, it gives us license to ask the next question, which is, what happens if China catches up with the United States in consumption per person? If we assume that the Chinese economy slows from the 10 percent of the last several years to 8 percent per year, and we run that into the future, then in 2031 income per person in China will be the same as in the United States today. If we further assume that they spend their money more or less as we do, if, for example, they consume as much paper per person as we do, then in 2031 China’s 1.45 billion people will consume twice as much paper as the world currently produces. There go the earth’s forests. But consider a China with three cars for every four people, like us. China would have a fleet of 1.1 billion cars. The current global fleet is 800 million cars. China would have to pave over an area comparable to the area now planted in rice just to have enough roads, highways, and parking lots. Its oil consumption would be 99 million barrels a day. The world is currently producing 84 million barrels a day. What China is showing us is that the Western economic model—the fossil-fuel-based, automobile-centered, throw-away economy—is not going to work for China. If it doesn’t work for China, it will not work for India, which by 2031 may have an even larger population, nor will it work for the other three billion people in the developing countries, who are also dreaming the American dream, and in an increasingly integrated global economy, where we all depend on the same grain, oil, and steel, it won’t work for us in the industrial world either. I think in the minds of most readers of Plan B 2.0 that may be the most important single point, and it’s all summarized in two pages in the first chapter. Our challenge—the challenge for our generation—is to build a new economy, one that is powered not by fossil fuels but largely by renewable sources of energy, one that has a much more diversified transport system, and one that reuses and recycles everything. The exciting thing is we have the technology to build such an economy, an economy that will sustain economic progress. We see glimpses of the new economy emerging here and there around the world. We see it in the wind farms of Western Europe, where 40 million people now get their residential electricity from wind. We see it in the solar rooftops in Japan. We see it in Iceland where 91 percent of all homes are now heated with geothermal energy, virtually eliminating the need for imported oil for heating purposes. We see it in the European cities of Amsterdam and Copenhagen, where 35 percent of all trips are taken on bicycles. We see it in the fast growing fleet of hybrid cars in the United States. We see it in the solar-thermal water heaters on the rooftops of nearly 40 million homes in China. It’s a remarkable situation that’s not well known outside China, but this technology, the simple rooftop solar water heater, of which I think we have a couple million in this country, but this technology has leapfrogged in the rural areas where there is no electricity. With the expenditure of $160, people can have hot water for showers and for washing dishes where they’d never had hot water before. Nearly 40 million homes—an extraordinary development. I mention these things just to give a sense of what’s possible. Another one is in this country. We hear a lot about California and what Governor Schwarzenegger is doing to develop solar energy, but the biggest story is in Texas. Republican governor Rick Perry put together a coalition of wind farm developers and transmission line builders to develop a huge wind farm that produces 7,000 megawatts. How much is 7,000 megawatts? The average coal power plant in this country is 300 megawatts. This is not incremental thinking. This is quantum jump thinking. It reminds me of Elizabeth Colbert, a writer for the New Yorker, doing a profile on Amory Lovins and asking him the question about thinking outside the box. Amory said, “There is no box.” There is no box, and that’s the mindset we need today. Forget the box and a lot of things can happen. We’re beginning to see them. I sighted a couple of examples—the rooftop water heaters in China and the huge wind farm in Texas—but I could go on at length with things that are beginning to happen in an exciting way. When I was working, researching, and writing Plan B 2.0, I spent some time reading books about earlier civilizations and what happened to them. One was The Collapse of Complex Societies by Joseph Tainter. Another was Collapse by Jared Diamond, which looked at why societies collapse and what indicators they should have been looking at and focusing on. I asked myself, “What indicators should we be looking at, in our early twenty-first century global civilization?” Although I wanted to come up with a dozen, I ended up with two. One is environmental: the atmospheric concentration of carbon dioxide. The second is economic: the price of oil. We are an oil-based civilization. Oil is a depletable resource. It is being rapidly depleted. You look at the data for the last five years; oil production, oil consumption, has exceeded new discoveries by a ratio of four to one, which means each year proven reserves are dropping and dropping fast. I don’t know if it’s going to be this year or next year or five or ten years from now, but my sense is we are reaching a point where we may soon be living in a world very different from any we’ve known in our lifetime. Throughout our lifetime, world oil production has been climbing, but very soon our children will be spending most of their lives in a world where oil production is declining. It will be a very different world, so different that it is not easy to describe. We have long been concerned about the affect rising oil prices have on food production costs, and that continues to be an issue. But more importantly is the affect of rising oil prices on the demand for agricultural commodities. What we have come to realize is that almost everything we eat can be converted into fuel, ethanol or biofuel, for cars. In 1978, the Biofuels Program was launched. Its goal was to convert grain into fuel for cars. If you look at the production trends in 1979, I think, when the first facility came online, until just a year or two ago, the trend was almost horizontal; it was going up very slowly. But now that trend is almost vertical. This is not a gradual rise. The reason it’s almost vertical is not because the subsidy of 51 cents a gallon for ethanol driving investments, that’s always been that way, but because the price of oil has increased so dramatically. Immediately after Katrina, the price of oil went up to $60 a barrel and even to $70 for a while. It triggered an enormous interest in converting corn into ethanol for cars. It was like a gold rush. A huge amount of capital began going into the construction of ethanol facilities. As the result, the capacity of the distilleries under construction today exceeds the capacity of all the plants built in the last 28 years. That’s why I said the trend is vertical. When those plants are completed, which will be when next year’s corn crop is harvested, they will require maybe 120 million tons of grain, which is pretty close to 30 percent of the total US grain harvest. We are using mostly corn, not entirely, but mostly, and a little sorghum, barley, and low-grade wheat, here and there. So what happens to the US corn crop is of importance to the entire world. The world corn crop is now the largest of the grain crops. That’s not always been so, but it is today. Corn has overtaken wheat as the leading grain in the world. Last year corn production was about 700 million tons, wheat about 600 million, last year a little under 600 million, and rice about 420 million tons. So the corn crop is large. Forty percent of that corn crop is produced in the United States. Close to 70 percent of all corn imports in the world come from the United States. The US corn crop is huge. The Iowa corn harvest is larger than the entire grain harvest of Canada. We have an extraordinary piece of agriculture real estate here in the Corn Belt. There’s nothing like it anywhere in the world. People say if it gets hotter and dryer the Corn Belt will just move north of the Great Lakes. I know immediately when someone says that that they are not an agronomist. The soils north of the Great Lakes are not the soils south of the Great Lakes. I think glaciers must have pushed all the topsoil south of the Great Lakes. They didn’t leave very much north. When we look at the use of a food commodity, particularly grain and corn, the industry likes to say that this is just an interim stage; we are moving toward cellulosic ethanol, and I think we are. It’s not yet clear exactly what form it will take, whether it will be a mixture of prairie grasses, which have been identified here at the University of Minnesota as perhaps the most productive and the best choice, whether it be grass or wood chips or something else, but I think we are going to move toward cellulosic ethanol and I think that will be a useful thing. The problem is it will probably be at least a decade away. I think it is David Hillman, here on campus, who is pointing us in that direction. Incidentally, in the research in this area, in the writing, the University of Minnesota is ground zero. This is where much of the thinking is coming from on this issue, so it is appropriate that we have this discussion in today’s Freeman Forum. What I’m wondering about is why I am here when there are so many experts here at the university. There is a great article in the next issue of Foreign Affairs, by Ford Rungi and Benjamin Senain on the affect on world hunger and the increase that the ethanol affect will have in increasing the number of hungry people in the world. I think there will be a place for cellulosic ethanol, and we need to be investing a lot more in research in this area, but it’s not close yet. We have to deal with the situation we are now faced with, which is an enormous conversion of grain into ethanol. One thing that becomes clear as we look at grain-based ethanol is that, from an agricultural point of view, the world’s demand for grain-based ethanol is insatiable. Filling a 25-gallon-SUV tank with ethanol takes enough grain to feed one person for a year. Figure out how many tank fills in a year and how many people can be fed with that grain. That number, to put it in perspective, is well above average grain consumption in India, but somewhat below that in Italy. It is a bit below the so-called Mediterranean diet in terms of resources. If we were to convert an entire grain harvest into ethanol for cars in this country, it would satisfy at most 16 percent of total needs. What we are looking at today, and I don’t think many people realize this yet, is that, with the construction of so many grain-based ethanol facilities, the line between the food economy and the energy economy is beginning to disappear. The two economies are fusing, in effect, becoming one. In that situation, the world price of grain is moving up toward its oil-equivalent value, because if at any time the food value of a commodity is less than the fuel value the market will move that economy into the energy economy, and that is exactly what is happening. What we are looking at is the emergence of what I consider an epic competition between the 800 million people in the world who own automobiles and who want to maintain their mobility and the two billion poorest people in the world, who are simply trying to survive. We’ve never faced a moral or social issue like this before because there has never been this sort of competition. There is no one, there is no UN agency, no international office to mediate this competition between automobile owners, whose average income is about $30,000 a year and the average income of two billion poorest people of the world, which is well below $3,000 a year. It’s easy to see in this competition who is likely to win. But it brings up an interesting foreign policy question. Brian, you were meeting with Condi Rice and others yesterday to talk about some of these issues. We need to recognize the foreign policy implications of this, because if the world begins to see us as a country that’s determined to drive its SUVs, regardless of the consequences for the rest of the world, it will not enhance what is already a seriously damaged national image. I think politically we cannot afford this. Someone needs to take charge, and I think that needs to be in Washington. This is not to eradicate the biofuels program. What I would like to see is a time out, a moratorium on licensing distilleries, while we take inventory and decide exactly what’s happening and then where we want to go, because right now the market is driving everything. The market has a lot of useful attributes, but making this decision may not be one of them. We need to think it through very carefully. My concern is that we may see rising grain prices and rising food prices throughout the world on a scale that could lead to urban food riots in scores of low- and middle-income countries that import grain. We have seen this already in Mexico. The world corn prices have roughly doubled over the last year, with wheat prices trading at a ten-year-high and rice prices moving up. Mexico was hit first because it has a corn-based economy and the price of its staple food, the tortilla, is up 60 percent, which is why there were tens of thousands, maybe altogether, hundreds of thousands of Mexicans taking to the streets. Every time the president appeared in public, people would gather in protest. If you are a low-income Mexican and the price of a tortilla jumps by 60 percent, you are in trouble. But this is only the beginning. We are just starting down this road of tightening supplies. This year we will have probably a 15 percent increase in corn acreage, and with a little luck, a substantial increase in the corn harvest. So we need, again, to keep the big picture in mind. Mike was mentioning water shortages at the beginning. They are beginning to reduce grain production in some countries: grain production in Yemen, wheat production in Mexico, wheat production in China. So the water situation is beginning to tighten, and water shortages will eventually turn into food shortages. But in six of the last seven years, world grain production has fallen short of consumption. Now that can happen only if you have stocks controlling, and that’s exactly what has been done. In six of the last seven years, we’ve drawn down world grain stocks to the point now that it is at the lowest level in 34 years. In order to just maintain the status quo, we have to overcome with this year’s harvest, the 71-million-ton grain shortfall of last year, plus another 20 million tons to satisfy growing world food and fuel needs. Remember, we are adding 71 million people a year. And we have allowed for the 25-million-ton increase in this year’s harvest of additional grain going to ethanol distilleries in this country alone. When you add that up, it comes to 150 million tons. That’s how much increase we need just to avoid any more decline in stocks, and 150 millions tons is well over 5 percent of the world grain harvest. Thus we need a 5 percent increase in the world grain harvest in order to do that. The odds of getting that big a jump are probably not too good. I think we probably will get some increase because of higher prices, not much question. But then climate is the wild card in this. My concern is about rising food prices around the world, and we are seeing this already, and I won’t go into details of the numbers and the countries, but it’s happening. My concern is that soaring food prices could greatly increase the number of failed states, a list growing longer each year. Then we have to ask the question, how many failing states does it take before we have a failing civilization? At what point do things begin to break down, things that we take for granted like controlling the spread of infectious diseases, whether it’s SARS or avian flu or hoof-and-mouth disease or what have you? How many failing states before the international monetary system begins to unravel? I don’t know the answer to these questions, but these are the sorts of questions I think we need to be asking, especially when we look at the question of how much of our grain supply do we want to convert into fuel for cars. These are not trivial issues. There are alternatives. For example, if we were to raise automotive efficiency standards by 20 percent over the next decade, similar to what we did when President Ford signed legislation in 1976, we would reduce oil inputs several times more than we are doing with our fuel ethanol program and at a fraction of the cost. Or consider another exciting option, which is shifting to plug-in hybrids, which we are in the process of doing. If we really were to speed that up with incentives and disincentives, then another option opens up. This is if you take a hybrid car, like the Toyota Prius, which is the most popular of the hybrids, add a second storage battery and the plug-in capacity so you can recharge the batteries while you are sleeping at night, then we can do most of our short-distance driving, daily commuting, and grocery shopping with electricity. Now while we are making that shift to plug-in hybrids, if at the same time we invest not in hundreds of wind farms across the country but in thousands of wind farms, feeding cheap electricity into the grid, then we are running our cars largely on wind energy at the gasoline-equivalent cost of under a dollar a gallon. The great thing about wind is no one can cut off the supply, no one can control the supply of wind, and the combination of wind, which fluctuates with plug-in hybrids, is that the batteries in the cars become the storage facilities of the wind energy. Then, of course, with a hybrid you have a tank of gas in the back if you need it. These are the new possibilities. There is a strong plug-in partnership lobby that has more than 500 members now, from corporations, electric utilities, state governments, city governments, and so forth. It’s gaining momentum, and I think it’s clearly a move in the right direction. Two or three points and I will wrap up. One is the key to restructuring the global economy, which I talk about in Plan B 2.0 in some detail. We must get the market to tell the environmental truth. Right now the market does not include indirect cost. When you buy a gallon of gasoline for, say, $3, you are basically paying for the cost of pumping the oil out of the ground, refining it into gasoline, and getting the gasoline to a local service station. You are paying the cost of damage from air pollution, the medical cost from treating respiratory illnesses, and certainly not the cost of climate change. If you include all those costs, then the $3 is more like $11. I could go through many other examples of how the market is under-pricing so many things. You remember a company called Enron? Enron was probably on the cover of more business magazines in the late 1990s than any corporation in the country, a remarkable success. Wall Street investors waited eagerly for their quarterly reports to show how much their sales and their profits and things were growing. They became the seventh most valuable corporation in the United States. Then in late 2001 and early 2002, some outside accountants began looking a bit more carefully at Enron, and what they discovered was that Enron had been leaving costs off the books and that, in reality, Enron was worthless. A company whose shares had been trading at $56 dropped to pennies. We are doing exactly what Enron did; we are leaving costs off the books big time, and we will eventually face the same consequence if we do not make some course corrections. The costs we are leaving off the books today someone will have to pay for, if not today, if not us, then our youngsters. The challenge is to get the market to tell the truth, and the way to do it is to analyze the indirect costs and incorporate them into the tax system. For example, lower income taxes and raise carbon taxes. We are not talking about raising taxes. We are talking about restructuring taxes. We won’t pay more taxes, but instead of taxing work, which we should be encouraging, we will be taxing carbon emissions, which we should be discouraging. A very simple concept. Øystein Dahle, who was for many years vice president of Exxon for Norway in the North Sea, said in the early 1990s after the collapse of the Soviet Union, “Socialism collapsed because it did not allow the market to tell the economic truth. Capitalism may collapse because it does not allow the market to tell the ecological truth.” And that I think sums it up very nicely. In looking at resources, I think time may be our scarcest resource. We don’t know on the climate front where the key thresholds are. We don’t know at what point the melting of the ice sheet in Greenland will become irreversible, but at some point it will. We don’t know because nature sets the threshold. Nature is the timekeeper, but we can’t see the clock, so we are dealing with uncertainty. We don’t know how much time we have to make these big changes, to dramatically cut carbon emissions. Sometimes people wonder, given the problems we are facing, what basis there is for hope. The good news is that social change comes very quickly sometimes. I spend a lot of my shaving time thinking about social change and how we can make things happen quickly. Remember the Berlin Wall? November 1989 it came down. It was the visual manifestation of a political revolution in Eastern Europe, a shift to democracy. One morning people woke up and realized that the great socialistic experiment was over. The one-party political system, the central planned economy, was finished. Even those in power did not attempt to suppress the revolution. It was remarkable, and yet not a single political scientist writing in political science journals anticipated it. No one said in the early and middle 1980s, watch Eastern Europe; a big change is coming there. It happened very quickly. Another example of rapid change would have been this country in the early 1940s. If you conducted a poll on December 6, 1941 and asked the American people should we get involved in the war or not, probably 95 percent would have said no. If you had waited until Monday, December 8 to conduct that poll, that ratio would have been flipped. On January 6, 1942, President Roosevelt gave his State of the Union address. In that address he outlined arms production goals for the United States. He said we are going to produce 45,000 tanks, 60,000 planes, 20,000 anti-aircraft guns, 6 million tons of shipping to face the enormously difficult challenge of fighting two wars on the far side of two oceans. No one had ever seen numbers like this before. Staggering. But what Roosevelt and his colleagues realized was at that time the largest concentration of industrial power in the world was in the US automobile industry. So after the State of the Union address, he called in the leaders of the industry and said because you guys represent such a large share of productive capacity, we are going to depend on you to reach our arms production goal. They said, Mr. President, we are going to do everything we can, but it’s going to be a real stretch producing cars and all these arms, too. He said, you don’t understand. We are going to ban the sales of private automobiles in the United States. That is exactly what happened. From the beginning of April 1942 until the end of 1944, there were essentially no cars produced in the United States. And it didn’t take decades to restructure the US industrial economy. It didn’t take years. It was largely completed in a matter of months. That is the kind of situation I think we are in, and in Plan B 3.0, I talk about a wartime-type of mobilization to restructure the world energy, moving away from fossil fuels toward renewable sources of energy. It’s possible; it’s going to happen. My final point would be this. Many of us in this room have been working for years and years and some of us for decades trying to bring about change, with another project here and innovation there and another policy there. But we are still losing the war. We need to change the system. I mentioned restructuring taxes to get the market to tell the truth. If we can do that, then many things will begin to happen and the restructuring will move very quickly. We have passed the time when if you ask me what I can do and I say recycle your newspapers, turn off the lights when you leave the room, and that sort of thing. We have to change the system now. We are not talking about the future of the planet. We are talking about the future of civilization. The stresses are building, and some governments are already failing. We have to reverse that process. If that process keeps going, the end result is clear and inevitable. We’ve got to become politically active, everyone. Saving civilization is not a spectator sport. We have to vote; we have to lobby; we have to raise questions of political candidates; and we have to support those candidates that understand the issues and want to do something. We need to write letters to the editor, write op-ed pieces, organize groups, and meet with your elected representatives and talk about these things and see what they want to do and let them know what you want to. Michael Freeman: Wow. I think you can see now why Les Brown sells books, why Orville Freeman loved Les Brown, and why he has so many things to share with us. We now have a few moments for questions directly with Les, then we are going to break for lunch and then have a couple panelists with Dr. Brown sharing. I wanted to share one more of your we-can-do-what-seemed-impossibles. This is the kickoff of the American environmental movement. You will recall that there were a couple of profound books, a river near Lake Erie literally burned, and Silent Spring, and people, college students had a fit. And we had the first Earth Day, and if I recall correctly, that was 1969. From Earth Day came the Clean Water Act, The Clean Air Act, and some major environment corrections. It was a rush of energy in this country that made a whole lot of difference. We have some wonderful environmental friends who know better than I, but as a college student at that time, we were kind of despondent over the Vietnam War. We were kind of despondent about what we thought of corporate America. Even those of us who were privileged to be in Washington at the time were pretty frustrated at what seemed to be the lack of energy with the Civil Rights Movement. But a book, an event, and energy from people who said we need to change this world has made a lot of difference. So I’m really pleased that you ended your comments with some examples of that and some hope. Now, we’ve got some folks who will help us with questions, and we have one right over here, please. Question: I’m Alan Roebke with TruePolicy.com, and I want to thank Dr. Brown for presenting the debit side of the balance sheet. I guess I would like to add in the asset side of the balance sheet in our debate today, and on a couple of simple points. Socialism plans for the future; capitalism adjusts for the future. I think you made a great point for the audience on a tank of ethanol in that Suburban. In fact, what shows is that one tank of fuel going into that Suburban would indeed give a person 2,200 calories per day for an entire year, but the farm selling price of corn in the United States in 2005, for the audience here, do you realize your food bill would have been $18 in 2005. Now when they talk about the price of ethanol driving the price of food up so much, your price of food would have been $28 this year, and we spent $9 billion in 2005 to subsidize American corn farmers because of the cheap $18 price I referred to. But if we had just taken half of that and given, like the doctor rightfully points out, 800 calories of energy to all of the 160 million hungry people in sub-Saharan Africa, hunger would have ended there, and we could have done it for half the money we spent on subsidizing farmers. I’m glad you are here today, Dr. Brown, but I wanted to make the group focus on the asset side as well, and then I will leave with this as well. That corn that made the ethanol, if you look at the asset side and this is from university research I take this from, I asked Dr. Alfredo, a foreign name to me, anyway, I said what if I take x-number of bushels of corn, how many cattle can I feed for a 126-day feeding trial? He said you will feed a thousand head of cattle. I said, what if I take that same amount of corn that will feed a thousand head of cattle and run it through an ethanol plant first and then how many cattle can I feed? He said you still will feed 600, and that 600 head of cattle will give us nutrients to put back in the ground and raise the next corn crop. So let’s look at both sides, the debit side and the asset side–TruePolicy.com, and you’ll see more. Lester Brown: I’m not sure your analyst got the 1,000 versus 600 quite right. I would use 1,000 and 300. Question: Hi, I’m from Walden University. I have a follow up question about your points regarding the SUV analogy and the growth in the use of energy, especially for transportation. What are your thoughts, if we are truly interested in being able to, not just change the way that we, as you put it, restructure our active economy that we can, and you talked about taxes and so on. What about restructuring the way that we conduct transportation, and what are your thoughts about, especially, how we can move from a car-based economy to a mass transportation one? Lester Brown: Good question, and just two or three quick points in response. We are seeing a growing movement to start designing communities and cities for people instead of cars. If you look at cars in this country and if you look at cities in this country, they are designed for cars, not for people. If you ask the question—and let me flash back to being in Tel Aviv seven years ago, launching the Hebrew addition of the book, and I was being driven from my hotel to the conference site. Tel Aviv is a very affluent city today and there were cars everywhere. Every nook and cranny was filled with cars, and it occurred to me at that moment that the best indicator of the livability of a city is the ratio of parks to parking lots. If the city has mostly parking lots, it’s probably not a fun place to be. If it has mostly parks, then it’s probably a place where people can enjoy life. Just to say quickly, I think we need a modern national rail-transport system. When I come back from Europe or from Japan and get on planes in this country, I feel as though I’m in a third world country. In terms of rail transportation, I am. We are a half-century behind the rest of the world. I think of the need for a national rail system, both for passengers, but, importantly, for freight. We are moving so much freight by truck now across the country and that takes an enormous amount of fuel. The great thing about a rail system is you can power it by electricity and that electricity can come from wind farms. Another point is to create an environment that’s bicycle friendly. In Amsterdam stoplights have two green signals. The first is for bicycles to go and the second is for cars. Can you imagine that in the United States? There are so many things we can do to make transport systems much more pedestrian and bicycle friendly, designing communities and so forth, and we need to do it. Question: I’m not sure this is a question you want to answer, but of the current presidential candidates, do any of them get it? Lester Brown: There is another question, which is are they capable of getting it? John McCain has actually been pretty good on climate. He has been speaking out on this for some years now. He wants to see action there. In talking with the environmental groups in this country, they have been pleased with their efforts to work with Obama on these issues, but I can’t pretend to speak for all the candidates and where they are on the issues because I’m not even sure they have all defined their positions yet. Question: I don’t think you said too much about any attempt at population control in managing this issue. Any thoughts on that subject? Lester Brown: If you read Plan B 2.0, you will see that population is woven throughout. One of the things that I’ve noticed in analyzing failed and failing states is that 17 of the top 20 countries on that list are countries that are caught in the middle of a demographic transition. They have gotten their death rates down and have reduced mortality as a result of early development, but they have not been able to advance far enough to also reduce fertility. The fact that they are trapped there with populations begetting poverty and poverty begetting population growth is something I think they will need some help with, and I think that is where the foreign aid programs are going to have to play an important role in providing basic education, healthcare services, family planning services, reproductive healthcare, and so forth. I think population, continuing rapid population growth in a number of countries, is one of the biggest threats to future security that those countries and the world face. Comment: This is probably another area, Dr. Brown, where your indirect cost analysis could be quite useful. Question: I grew up down in the extreme southwest corner of Minnesota. My family owned a great deal of farmland, a lot of it in corn production, and I know how much energy, in various forms, it takes to keep a cornfield productive. It’s a lot. Lester Brown: It is. One of the great advantages we have in this country is the corn-soybean rotations. Soybeans do fix quite a bit of nitrogen, which reduces the amount you have to use for corn in the next crop. But there is no question but that our food system is highly energy intensive and, more specifically, very oil intensive. Question: Thank you. David Paxton with WorldPopulationBalance.org. You already covered part of my question earlier about population, but I think another point is just to stress something. Right now people say that we are going to have 9+ billion, and we have 6.5 billion people now, but that’s really not inevitable. I think it is really important that we recognize that we have the ability, just like we have the ability to change course on how we are handling renewables, switching from an oil base and all, we also have the ability to humanely slow, through family planning, to humanely slow and stop population growth on the planet at maybe 8 to 8.5 billion or less, rather than allowing it to go to 9 to 9.5 or 10 billion people. Lester Brown: My quick response would be, I don’t think we are going to see 9 billion people. We may not see 8 billion people. The question is, will we not see that many people because we get our act together and reduce fertility, or because we fail to and mortality rises and begins to check the population growth, as is already happening in several countries in Africa? Now I think for the first time, at least in modern history, we have projections of population decline in four countries in Africa, not because of falling fertility, but because of rising mortality. And, I think, in all four cases the HIV academic is the principal source of the rise in mortality, but that could begin to spread. We look at the projections and the increases in the number hungry in the world from 800 million today to 1.2 billion in 2015. If we continue on the current ethanol trajectory, that’s going to lead to rises in mortality. As I look at the world and look at people on the various economic rungs, there are a lot of people on the lower rungs of the ladder who due to a substantial rise in food prices will lose their grip and start falling off. That is why this article that Ford Runge and Benjamin Senhain have done for Foreign Affairs magazine is such an important contribution. Question: On the topic of working towards helping those lower rung people in the population of the world, how can we help them become more self-sustainable? Even if we up their production to the point that helps feed them, how can we help them to produce and improve themselves also? Lester Brown: How can we help them produce more to feed themselves? One of the keys, I think, is education. The more education people have, one, the fewer children they have, and two, the better their diets are for a given income, because they understand nutrition better. But also, they have a greater capacity to increase their production because they understand the technologies that are used in raising land productivity, some of which may be relatively simple and local. But education, and then creating credit mechanisms so they can borrow and invest in improving the productivity of land. We need to be working on both sides of the equation, both population growth and raising food production in these countries. Question: I’m from the Center for Truth in Science, Technology and Public Policy. I wanted to probe your viewpoint on cellulosic ethanol a little bit more and the use of agricultural waste, and particularly, corn silver. I guess I’m a little more optimistic about cellulosic ethanol as part of the solution. Ten years doesn’t seem like that long ago, which actually could be closer in time if we had a concerted effort in order to develop the infrastructure and improve upon the technology that already exists that produce ethanol from cellulosic ethanol materials. I just wanted to probe your viewpoints on that as a national or even international policy strategy a little bit more. One could envision taking subsidies for grain-based ethanol and converting them to subsidies for cellulosic-based systems. Lester Brown: The subsidy, the 51-cent-a-gallon subsidy for grain-based ethanol, also applies to cellulosic ethanol, so that’s in place. Using corn stalks to produce ethanol bothers me a bit, as a former farmer and as one trained in the agricultural sciences. Once you start removing the corn stalks along with the corn, then the organic matter content of the soil begins to decline, and with that the soil structure declines and it becomes more subject to erosion. Its water storage capacity declines, its nutrient storage capacity declines, so my sense, as an agronomist and as a former farmer, is we may not want to go too far down the road of using crop residues, which some people call waste. I think of corn stalks as organic matter that maintains soil productivity. Question: My name is [inaudible]. I’m with the Minnesota Millennium Initiative and the United Nation Association of Minnesota. You made a very interesting observation about President Roosevelt getting the automobile people and converting them to make the military. I guess we have not stopped since then in growing our military. Today we are the largest producer of military, more than 50 percent of the armament, and we are only providing 20 to 25 percent to what our US policy has committed to the Millennium Development goal, for example. In your conversation today, which is absolutely fantastic, there was no mention of any linkage to the kind of expenditures we have in our military and if there was a real transformation, which would include, perhaps, diminishing us and moving on to a better world through supporting the Millennium goals. How would you propose we go about doing that, and do you think that is desirable? Lester Brown: It’s actually in Plan B 2.0. The last chapter talks about restructuring our fiscal priorities, and makes the basic point that spending hundreds of billions of dollars a year on high-tech military systems is largely irrelevant today. We are not fighting the Cold War anymore. We are dealing with new threats to security, like climate change, like poverty, and these are the things we need to be focusing on. We should make sure we are spending at least enough to reach the Millennium Development goals, if not to go even further. So I am completely in synch with you on this question. As Jeffrey Sachs has pointed out, for the first time in history we have the resources to eradicate poverty in the world, if we choose to do something, and I think we should. Michael Freeman: You who came from schools today, think about the phrase that Dr. Brown has shared. I’m not a student but an academic, but this is the first time in society’s history that we can eradicate hunger. Population control through hunger is a horrible way to control population. So just think about that incredibly unique opportunity. Thank you, Les, for sharing that. Question: I am from the school of environmental studies. With transferring our energy to wind energy and alternative sources, does that mean the possible demise of resource-intensive cities such as Los Vegas and Phoenix? Those areas don’t produce much energy but they use multiple-times of what they do produce. Would that mean the possible economic or even altogether demise of those cities? Lester Brown: Unfortunately, I don’t think so. [laughter] What I am seeing now as I look at the world is that the new energy economy will have to be fashioned by each country, depending on its indigenous resources. For the southwestern United States, the area that includes Los Vegas, for example, probably the answer is going to be solar-thermal power plants. There is enough sunlight in that region to run the US energy economy seven times over, it’s huge, and that may well become the source of energy. The interesting thing is that over the last century we have seen the globalization of the world’s energy economy, as the entire world has moved towards the same management source, namely oil, so it’s become ‘one size fits all.’ But as we move now into developing local energy resources, whether it’s geothermal or wind or solar or what have you, we are looking at a localization of the world’s energy economy, as each country becomes more self-sufficient. The reason is each country will have to fashion its own strategy to develop resources that are most abundant there. I think for that part of the country solar-thermal will become an important source of energy. Michael Freeman: We have time for one last question. Acting on a complaint by Brazil, a World Trade Organization (WTO) dispute panel in 2004 found that U.S. cotton program subsidies violate the United States’ own trade obligations as agreed upon by Congress in 1994. This finding greatly complicates U.S. farm policy. In 2007, Congress must reauthorize agriculture legislation, but how will the new Farm Bill differ from present policy? How will U.S. net farm income-currently dependent on farm subsidies-be provided if existing subsidies are illegal? Can policymakers design a system that will enable farmers to live on farmgate sales in an international context in which excess global production depresses farm prices? The Freeman Lecture will shed new light on this dilemma with speakers who include the former Brazilian trade negotiator who led the successful challenge to U.S. cotton subsidies, along with an agricultural economist who builds new policy ideas upon those that former Minnesota Governor and U.S. Secretary of Agriculture Orville L. Freeman proposed for supply management half a century ago. Members of Minnesota’s Congressional delegation who serve on the House and Senate agriculture committees that will craft new agriculture legislation are invited to provide their perspectives. Brazilian Association of Pork Producers and Exporters. In his previous position as Secretary of Production and Trade in the Ministry of Agriculture of Brazil, he was responsible for agriculture negotiations at the WTO, Free Trade Area of the Americas, MERSOSUR-European Union, and other bilateral agreements. He initiated and developed strategy on such sector disputes as the U.S.-Brazil cotton case and the Brazil-European Union sugar case. Camargo served as president of the Sociedade Rural Brasileira from 1990 to 1993 and founded and was president of Fundo de Desenvolvimento da Pecuaria de São Paulo (FUNDEPEC) from 1991 to 2000. He holds a doctorate in engineering from the University of São Paulo and a Master of Science from the Massachusetts Institute of Technology. Professor Daryll E. Ray established the University of Tennessee’s Agricultural Policy Analysis Center in 1992 and has served as the center’s director since that time. Throughout his career, Ray’s research primarily has focused on commodity policy, development of analytical models for policy analysis, and deepening the understanding of the structure and nature of the agricultural sector. He was one of few agricultural economists who predicted that the farm programs Congress adopted in 1996 and 2002 would fail to improve economic conditions for American farmers and, instead, would lead to declining farm income and instability in the U.S. farm economy. 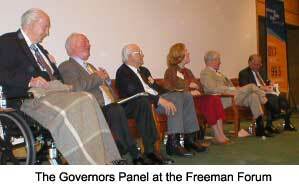 Thank you to Dr. Serageldin and all who participated in the 2005 Freeman Forum. Dr. Serageldin’s speech, Tides of Change is available in PDF (tidesofchange). To access an audio archive of the March 24 lecture, please visit Minnesota Public Radio’s Midday Program. Acces the Bibliotheca Alexandrina (Library of Alexandria) to learn more about Dr Serageldin and the projects he discussed. We were excited to have Dr. Serageldin join us for several presentations and discussions throughout his visit encompassing the Freeman Lecture series. All lectures were held on campus sites at the University of Minnesota Twin Cities. Registration information will be forthcoming in the next week; pre-registration is required to attend. Dr. Serageldin, Director, Library of Alexandria, also chairs the Boards of Directors for each of affiliated research institutes and museums and is Distinguished Professor at Wageningen University in the Netherlands. He has also served in a number of capacities at the World Bank, including as Vice President for Environmentally and Socially Sustainable Development (1992-1998), and for Special Programs (1998-2000). He has published over 50 books and monographs and over 200 papers on a variety of topics including biotechnology, rural development, sustainability, and the value of science to society. How can communities large and small and societies of different cultures and aspirations take best advantage of the communications and technological revolutions that mark the 21st century? Is the accelerating pace of change in science and technology creating a divide of “haves” and “have nots?” Dr. Serageldin will offer his perspective on the international status of science and technology today. Moderator: Phil Pardey, professor of applied economics at the University of MinnesotaThe seminar will be followed by a public reception in the Cargill Building atrium. Only a stone’s throw from the location of the ancient Library of Alexandria, the Bibliotheca Alexndrina is a new Egyptian enterprise of international scope and ambition. Dr. Serageldin’s vision includes using digital technology to make the world’s most important publications permanently accessible to billions of people all over the globe by creating a free-to-read, searchable collection of one million books through the Internet. Reception follows lecture in Andersen Library Atrium. A new movement seeks to lay a strong foundation for regional cooperation in the Middle East that will create a positive Arab entity on the international stage. Dr. Serageldin will describe this comprehensive reform process, which aims to address the individual situations of each country while also highlighting the features shared by all Arab societies. The University of Minnesota will bestow on Dr. Serageldin an honorary Doctor of Laws degree. The public is invited to attend. The Freeman Forum showed how and why our attitudes about community, consensus, and the common good have eroded. It also showed how we can restore them, through insights from past and present leaders and an understanding of the cultural context in today’s political will and societal choices. Four former Minnesota Governors spoke their mind about the state of Minnesota today. Former Governors Carlson, Quie, Anderson, and Andersen gave their candid opinions on current events such as taxes, conceal and carry, and more. The Governors’ panel was broadcast on Minnesota Public Radio’s Midday program and an audio archive of the broadcast is currently available on their web site. The event also brought together current politicians, nonprofit leaders, community leaders, students, and interested community members. Each attendee received a copy of Rodney Leonard’s recent book, Freeman, the Governor Years. The book is available for purchase. For more information on buying the book, please contact Jane Leonard at jleonard@minnesotaruralpartners.org or 651-645-9403 .